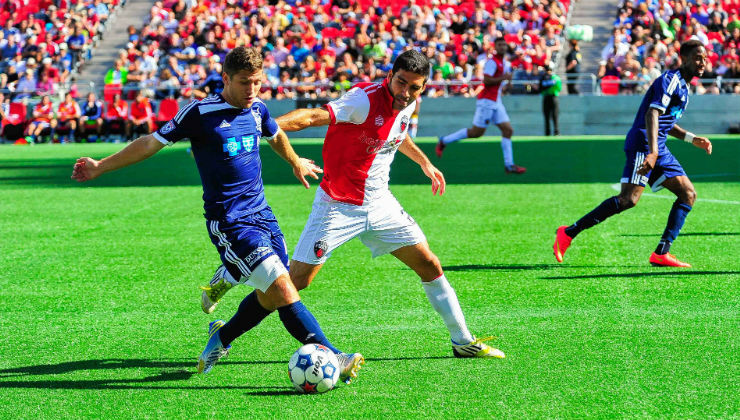 Ottawa Fury FC holds a 1-0 lead over the Carolina RailHawks after 45 minutes of play at TD Place in Ottawa, Ontario. The Carolina RailHawks (3W-1T-6L, 10pts) were moments away from leaving Ottawa victorious on Sunday afternoon, but were forced to settle for a draw after a controversial stoppage time goal by Ottawa Fury FC (1W-3T-5L, 6pts). Even-though the RailHawks dominated possession and created multiple opportunities in the first half, it was Ottawa who open the score in the 24th minute of play with a goal by former RailHawks forward Tom Heinemann. Despite being one goal down, the RailHawks came out strong in the second half. In the 61st minute of play, RailHawks midfielder Danny Barrera would go on to score his first goal of the season. After a series of deflections in the box Barrera found the ball outside of the area and with soft chip he send the ball to the back of the net to tie the game 1-1. Three minutes later RailHawks Midfielder Leo Osaki's took a shot which deflected off an Ottawa player in the box and landed at Tiyi Shipalanes feet. After dribbling towards the goal Shipalane blasted a shot past Ottawa's goalkeeper Romuland Peiser to give the RailHawks a temporary 2-1 lead. In the final moments of stoppage time, Ottawa's forward Oliver scored a controversial stoppage time goal in the 95th minute to tie the match and to send the RailHawks home with only one point.